Disclaimer: Meeple Mountain was provided a preview, prototype copy of the game. It is this copy of the game that this review is based upon. As such, this review is not necessarily representative of the final product. All photographs, components, and rules described herein are subject to change. Life as a citizen in the nation of Banana Republic is not an easy one. Every time you try to get ahead, it seems like there’s someone standing in direct opposition to you. Underhanded business dealings, shady investment advice, bribery, and outright theft are the norm. What’s an average citizen to do? Who can they turn to in these financially trying times? That’s where you come in! Because you see, you are no ordinary citizen. For, beneath that veneer of John or Jane Normal resides the heart of a hero. 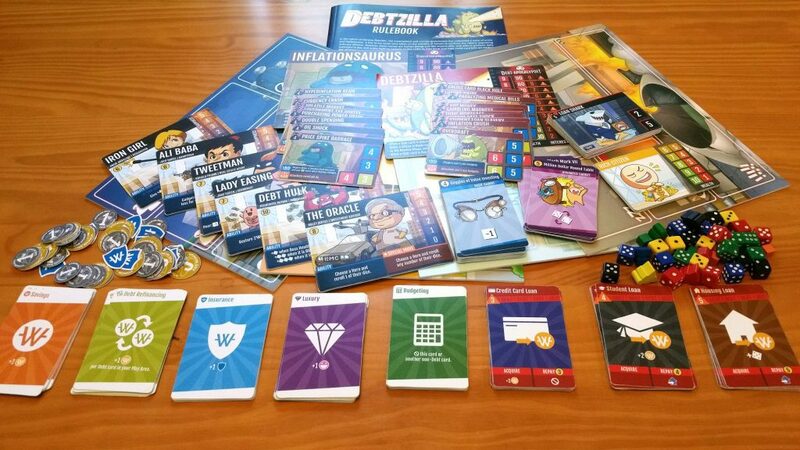 In the game of Debtzilla, designed by Xeo Lye and published by Capital Gains Studio, the players take on the roles of superheroes tasked with fighting off the villains threatening to bring Banana Republic to its knees. Ultimately, they will be facing down Debtzilla himself in a final showdown. Only by working together and making sound strategic decisions can they hope to win. But being a hero can get rather expensive, and the players are going to have to take out loans to pay for all of their fancy crime-fighting equipment… and that’s what Debtzilla thrives on: debt. Even as the heroes outfit themselves to win, they’re just making their nemesis stronger. 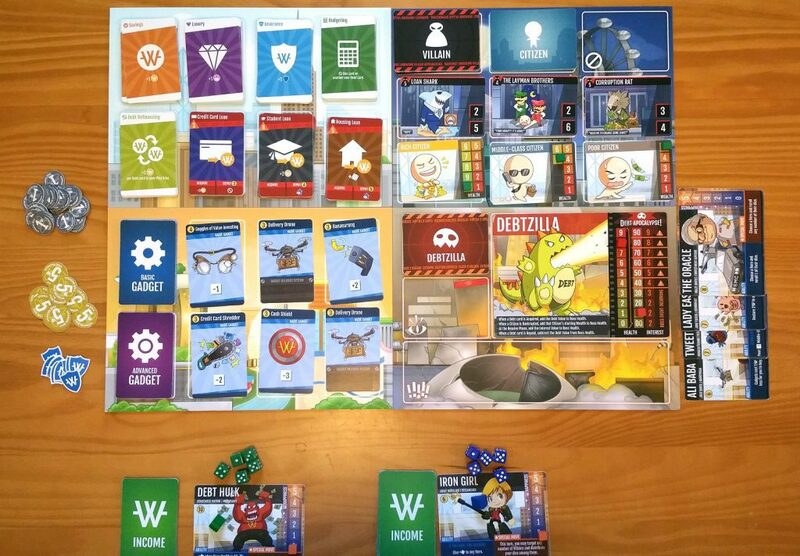 Debtzilla is packed with an array of cards, tokens, wooden pieces, and dice. The cards are used for various things from providing details of the citizens and monsters the players will be encountering, as a market for the players to acquire gear and merchandise, and as the means to pay for various things, etc. The wooden pieces are used to track happiness (this and other unfamiliar or weird terminology will be explained in due time), citizen wealth, and boss health. There are also a few meeples in different colors that the players will use to select the villains that they will be fighting during the course of the game. The tokens are used to represent money and insurance shields. In addition to the previously mentioned items, there are also four different boards for holding the various cards as well as two different boss monster boards. There are also several unique character cards. Each contains an illustration of the character and the stats associated with it. I’ll talk more about these later. The dice are just standard dice and come in 4 different colors (one set of dice per player). As far as component quality goes, the cardboard in this review copy is nice and thick and feels pretty durable, with a few exceptions – the coin and insurance tokens. These are all extremely paper thin which makes picking them up and handling them a nightmare. I wish they’d been thicker. Overall, though, it’s pretty decent as far as prototypes go. I’ve seen better and I have certainly seen worse. First, the four boards are laid out between the players and loaded up with their starting cards. The Shopping board is stocked up with the Gadget cards in their appropriate locations and six gadgets from the Basic Gadgets deck are laid face up onto the board. Then the Vigilante board is loaded up with citizens and villains. Once it’s all set up, there will be three faceup villains with a Citizen card face up beneath each of them. Each citizen receives a wealth tracker cube which marks their maximum wealth. Next comes the Boss board. One of the two included bosses is selected (Debtzilla or Inflationsaurus) and laid face up on the boss space with its stats showing. The boss health markers are arranged to mark the boss’s starting health and then the boss cards are shuffled into a deck and laid facedown into their location on the board. Finally, the Working board is arranged. Each of the different kinds of Income cards – Savings, Insurance, Luxury, Budgeting, Debt Refinancing, Credit Card Loans, Student Loans, and Housing Loans are placed face up into one of the locations on this board. Now that the boards are situated, it’s time to get the players set up. First, each player selects a character card and places this in front of them along with a Happiness marker set on the 0 spot of the Happiness meter. The players each select a color and take the pieces of that color into their possession. Each player receives a starting deck of cards comprised of 4 Luxury, 3 Credit Card Loans, and 3 Savings. These cards are shuffled together and laid next to the character card. In Debtzilla, all of the players act simultaneously, so it is unnecessary to select a starting player. With everything set up, now you’re ready to begin. 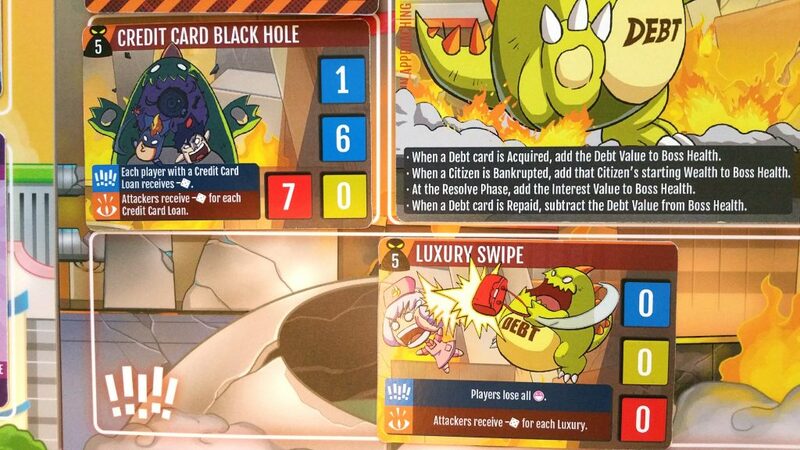 Debtzilla includes several different character cards for the players to choose from. Each of these character cards has a happiness meter along the right side of the card. Each character card also has two special abilities. The blue ability is available once per turn. The other ability can only be used once the character’s happiness meter has reached its maximum level. If this ability is used, the happiness meter is fully depleted and the ability cannot be used again until the meter is refilled. Each player begins with the same 10 cards and will have the opportunity to acquire more cards during the course of the game. These cards allow the player to earn the money they will need to buy crime-fighting gear and the happiness that they will need to use their special moves. There are eight distinct types of cards, but they are basically divided into two groups – debt cards and non-debt cards. 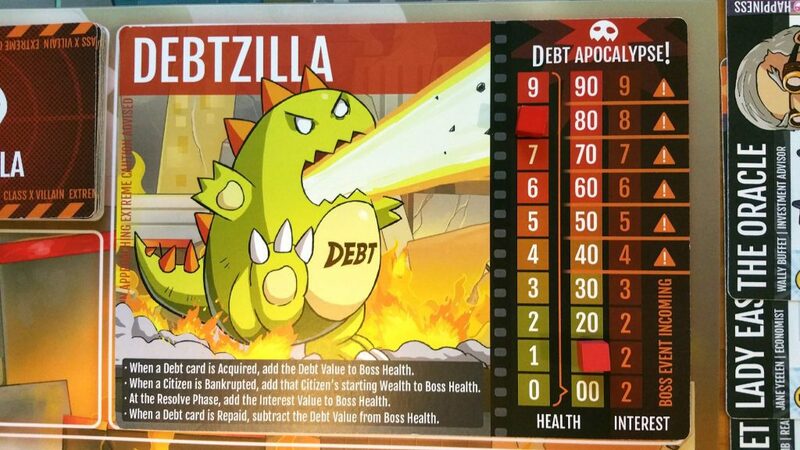 Non-debt cards can be added to the player’s deck without causing Debtzilla’s health to increase, but debt cards will cause his health to raise an amount equal to their debt value (the number in the orange triangle). The abilities of the non-debt cards are pretty self-explanatory. They either gain something or allow the player to do something. The debt cards, though, require a bit more explanation. Each debt card, in addition to its debt value, has two fields – acquire and repay. The acquire field shows what happens when the card is initially added to the player’s discard pile. For example, the credit card loan immediately gives the player 3 wonga (money) upon its acquisition. The repay field shows how much money it will take to pay off the debt and also what happens (if anything) when that debt is paid off. Typically, this will result in the card being permanently added to the player’s play area where its benefits will be provided every turn. A hero just isn’t a hero without his gadgets and gizmos and the heroes in Debtzilla are no different. 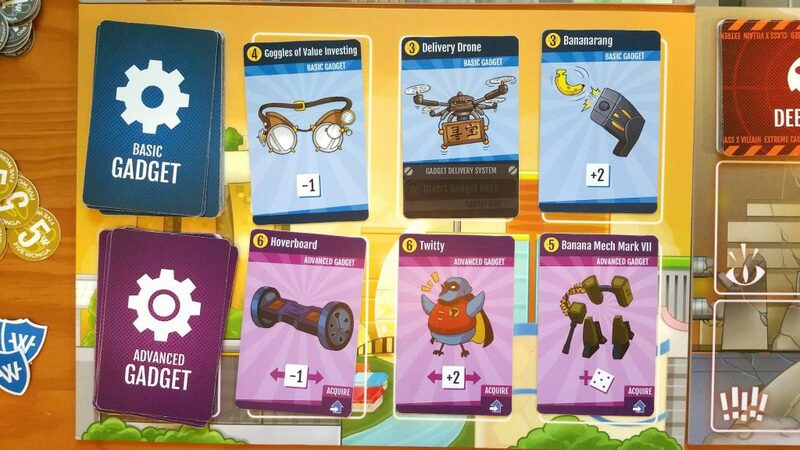 The Shopping board will always contain six items that can be purchased and added to a hero’s arsenal. There are two types – basic and advanced. The basic gadgets are typically cheaper and have limited effects. The advanced are more expensive but have more useful abilities. 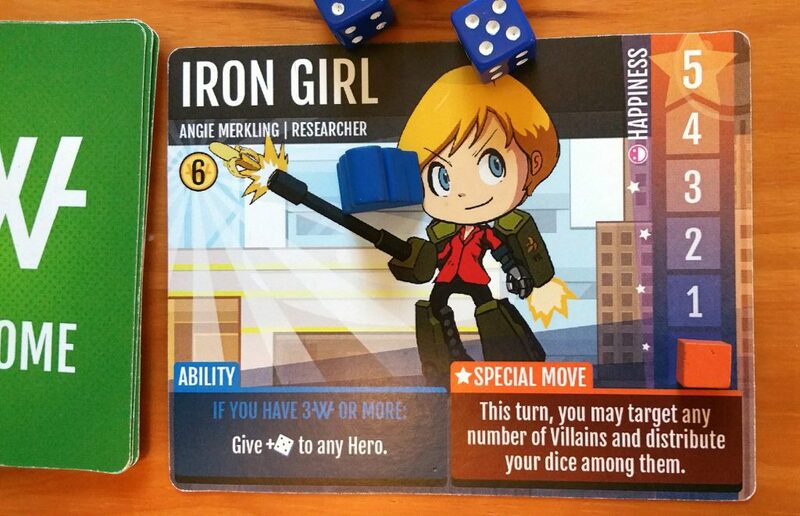 These items will allow the heroes to manipulate the dice or add additional dice during the vigilante phase. The cost of acquiring the item is shown in the upper left-hand corner of the card. Acquired gadgets remain in play permanently above the character card in the player’s play area. A player may only use a single gadget per turn unless they also own a drone (one of the gadgets). A drone allows the player to utilize an extra gadget per drone. There are also some character abilities that break the “one gadget per turn” rule. 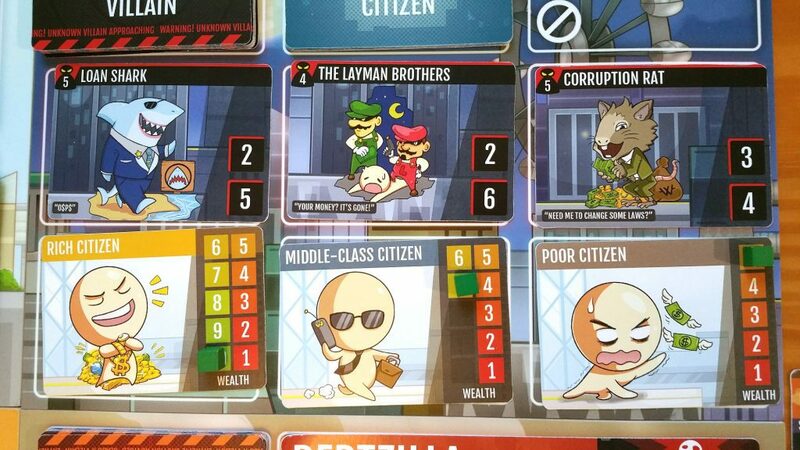 Debtzilla revolves around two main types of non-player characters: villains and citizens. Each villain has a scam value in the upper left-hand corner of the card and several weak points arranged along the right side of the card. During combat, the players are going to be targeting a villain and then rolling dice in the hopes that the numbers rolled match the numbers on these weak spots. Players will be able to use their special abilities and their gadgets to manipulate these dice rolls and multiple people can target the same villains. Undefeated villains scam the citizens for the villain’s scam value. There are three types of citizens: rich, middle class, and poor. Each of these citizens has a wealth meter and begin with their wealth at the maximum level. As they get scammed, their wealth meter diminishes. Citizens reduced to 0 wealth are bankrupted and sent to the jail/courthouse area of the Vigilante board. This will cause Debtzilla’s health to increase by an amount equal to the citizen’s maximum wealth value. As if the everyday villains weren’t enough, there’s an even tougher challenge that lies at the end of the road – the titular Debtzilla. Debtzilla’s starting health will always begin at 9 times the number of players. Each time a citizen is scammed into bankruptcy or each time a player takes a debt card from the Income card lineup, Debtzilla’s health will grow. Each time that a debt is paid off, his health will decrease. But this isn’t the only way that his health grows. Debtzilla will gain interest at the end of each round. The amount of interest (extra hit points) gained depends entirely upon his current health. The numbers in the column alongside the right of the Boss board is how the amount of interest gained is determined. As Debtzilla gains health, health thresholds will be reached and surpassed. These are marked by solid lines and caution symbols. Each time one of these thresholds is reached, one of the Boss Event cards is flipped up and placed into the “active” area of the Boss board (the area marked with exclamation points). The blue ability on the card will go into effect at the beginning of the following turn. At the end of that turn, the card is moved into the “awakened” event area to be used at the game’s end. 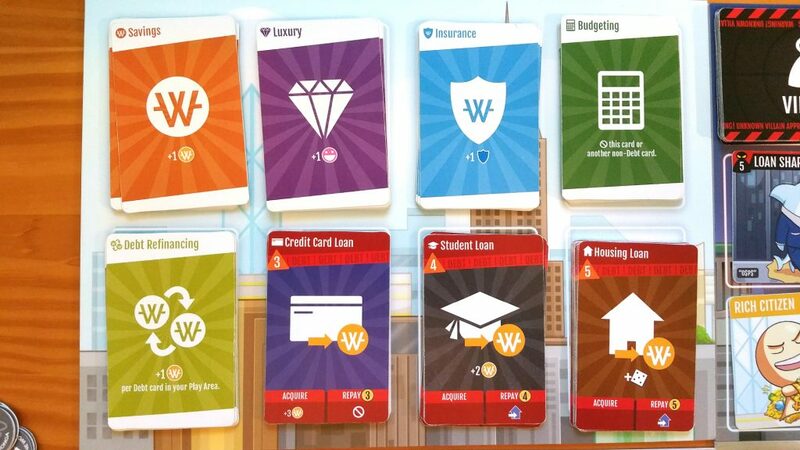 Working Phase – in which the players will draw 5 cards from their Income decks, place them into the playing area beneath their character cards, collect income, perform actions, and then either pay off a debt OR select a new Income card from the Working board and add it to their discard pile. Shopping Phase – in which players will have the opportunity to purchase a single gadget from the Shopping board. Purchased gadgets are placed at the top of the character card and are available for use during the next phase. Vigilante Phase – in which the players will be working together to defeat the villains by targeting the villains, rolling their dice, and attempting to hit the villains’ weak spots. Undefeated villains will scam the citizens by reducing their wealth. Any citizen that is driven into bankruptcy is removed from the game and this makes Debtzilla stronger. Resolve Phase – in which any active event cards are removed, defeated villains and citizens are replaced, and Debtzilla gains interest. The game of Debtzilla can come to an end in one of several ways. If every one of the citizens is scammed of all of their wealth, then the players will lose. If Debtzilla ever reaches 99 health, then the players lose. However, if the players are able to defeat all of the villains and then defeat Debtzilla, the players win the game. This is more easily said than done. Defeating Debtzilla isn’t easy. During the game, the players will cause boss events to trigger. After triggering, these events become awakened. When all of the villains have been defeated, three of these awakened events are selected at random and then placed face up into the villain fields of the Vigilante board. These cards are tough. They take a lot more to defeat, they scam for a lot more, and they all have abilities (the orange abilities) which have a direct effect on the players in some negative way. Before I get too far into the weeds about how the gameplay makes me feel, let’s talk about how the game looks. Anytime illustrations in a game start getting cartoony, it’s easy to slip into territory where it’s TOO cartoony and it’s hard to take games like that seriously at face value. Andy Choo and Alan Bay have done an excellent job at avoiding that pitfall. While the artwork in the game is definitely on the cheeky and silly side, it’s also got pizazz. The artwork here reminds me a little bit of King of Tokyo… incredibly silly, yet somehow really awesome at the same time. I dig it. As far as gameplay goes, any good cooperative game is going to have to find a balance between introducing randomness as well as giving players the means necessary to overcome it. Too much randomness and the game begins to feel hopeless and pointless. Not enough randomness and the game feels way too easy. When I play a cooperative game, I always like to feel like there’s some faint glimmer of hope on the horizon… as if the right card draw or the right die roll could tip the scales in our favor. I do not like being shut out by the game any more than I like running over everything that the game throws at me. These kinds of situations make the game unbearable and not very fun for very different reasons. As a player, I like to feel challenged without feeling overwhelmed or overpowered. Debtzilla has managed to find that balance. In all of the games that I have played so far, we either won or lost by the skin of our teeth. In either circumstance, it felt like it could easily go either way up until the very end… with one single exception. There was at least one occasion where we realized that there wasn’t even a point in finishing up the final round. Debtzilla was at exactly 90 health and none of us managed to draw a debt card. Without a debt card to pay off, there was no way for us to bring Debtzilla’s health down before the end of the round and we knew that he was going to gain 9 interest at the end of the round. So, regardless of whether or not we managed to kick all of the villains’ collective butts, we were still going to lose. On the one hand, this left a pretty bleak impression on the players involved. On the other hand, though, this is exactly the kind of situation that I was talking about earlier where one lucky card draw could have pulled us out of a nose dive. If even one of us had managed to draw a debt card, we could have paid it off, lowered Debtzilla’s health, and staved off disaster. We regularly argue in the Meeple Mountain staff chat about randomness in board games. Some of us really hate it while others embrace it and thrive on the chaos that it brings. I am one of the former. Randomness in board games, without a method of mitigating it, really bothers me. Debtzilla introduces randomness on top of randomness by not only having the players drawing cards but also chucking dice to determine outcomes. This might be a huge turnoff for some. However, I find that I don’t mind randomness so much when I am playing cooperative games. Maybe it’s because we’re all getting equally screwed or we’re all equally benefitting. It’s just much easier to choke it down when we’re working towards a common goal as opposed to working against each other. Debtzilla really surprised me. When I opened the box for the first time, I thought that the game looked and sounded weird. The theme is a little over the top. Debtzilla thrives on debt and there are plenty of avenues available for him to obtain that debt on which he thrives. Even the heroes are guilty. It’s inescapable. This serious subject matter is counterpointed by the puns and humorous artwork. Somehow, though, it all works. The more that I play it, the more that I find myself trying to figure out how to master it. The game requires a fine balance between incurring debt, getting geared up, and paying off those debts as quickly as possible. It’s a puzzle that I haven’t figured out yet, but I’m going to keep trying. Debtzilla, your days are numbered. I’m coming for you. But first, I’m going to buy this bananarang. Next postBob Ross: The Art of Chill Review – Happy Little Trees Means Happy Little Life!